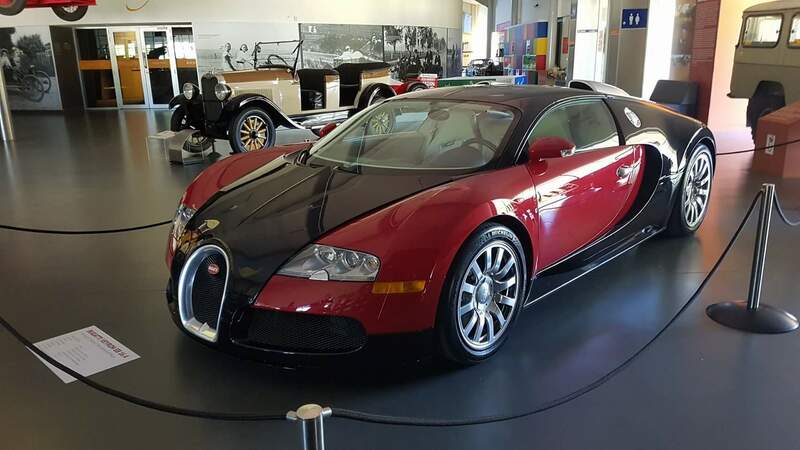 The Bugatti Veyron EB 16.4, one of the world's fastest and most expensive cars, is on display at our very own National Motor Museum in Birdwood, Adelaide Hills. The National Motor Museum has taken on-loan the 2008 Bugatti Veyron EB 16.4 from an anonymous donor and this rare Supercar with a market value of 2 million dollars will be on show at the museum for 3 years. Yes, three years of opportunity to magnify and see this machine up close and personal. The Bugatti Veyron EB 16.4 is an extraordinary feat of automotive engineering complete with seven gears and a special run-flat tyres that cost up to $20,000 each, specifically designed to handle the car's top speeds. Just imagine this, the Veyron can reach 100km per hour in 2.46 seconds and has a special spoiler that deploys to lower the suspension when it hits 220km per hour. It is 1 of only 71 sold in 2008, making it a rare treat to have on display at the museum. Brakes use carbon fibre reinforced composite discs, not metal. The vehicle's handbrake has an ABS antilock braking system. Around 450 Veyrons were produced before production ceased in 2015. The car has permanent drive to all four wheels, making it an all-wheel-drive model. SA rev-heads get along to the National Motor Museum in the Adelaide Hills township of Birdwood to see this one-off special supercar! The National Motor Museum is open every day from 10am – 5pm except Christmas Day and Catastrophic Fire Danger days. Location is at Shannon Street, Birdwood, 5234.
haha. stand in line Okay.